Two of the most commonly confused words are its and it’s. 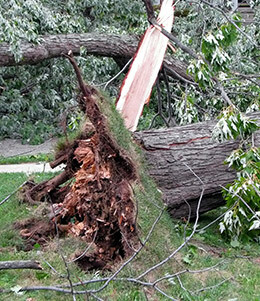 The wind showed its strength by knocking over a tree. It’s a shame that beautiful old tree is gone. So why are they so easy to mix up? For many writers, the confusion comes from the apostrophe. Because apostrophes can indicate possession, writers may mistakenly include one with its to show possession. Be careful to not fall for this trap. With pronouns such as it's and you're, an apostrophe indicates a contraction, not possession. Here’s a simple trick to avoid confusing the two. Whenever you come across it’s in writing, read the sentence out loud, but say “it is” instead of it’s. If the sentence still makes sense, keep the contraction version (it’s). If the sentence doesn’t make sense, use the possessive version (its). Your Turn Try out the trick. Read the following examples out loud, saying “it is” in place of it’s. Which sentence uses it’s correctly? Which one needs to replace it’s with its? The clock tower rings it’s bell every hour. It’s a beautiful, deep sound. Your Turn Fill in the blank with the correct form: it’s or its. When you’re finished, read the sentences out loud using the “it is” trick. The grocery store is known for _______ yummy donuts. _______ walls are covered with community art. _______ a beautiful day outside. To avoid colds, _______ recommended to take vitamin C.
My car is missing _______ radio antenna. _______ hard to tune in any channels. If you want to read my paper, _______ on Google Drive. I could use some help on _______ ending. _______ too choppy right now. When you read my paper, _______ okay to leave comments. Confusing “Its” and “It’s” by Thoughtful Learning is licensed under a Creative Commons Attribution-NonCommercial-ShareAlike 4.0 International License. Based on a work at k12.thoughtfullearning.com/minilesson/confusing-%E2%80%9Cits%E2%80%9D-and-%E2%80%9Cit%E2%80%99s%E2%80%9D.